Rick Crane is a world renowned bassist, recognized by progressive jazz listeners for his percussive, melodic style and expansive repertoire. A lifelong New Jersey resident, Rick started playing guitar and electric bass at 11 years old. In High School, he was drawn to Jazz by listening to his brother’s extensive Jazz record collection. He started playing acoustic bass and was performing professionally by age 17. While studying privately with bassist Michael Moore in Manhattan, Rick enrolled in William Paterson University’s prestigious Jazz Studies program. The jazz department was then headed by trumpeter Thad Jones and shortly after, bassist Rufus Reid. While continuing his private instruction with Moore and having the guidance of Reid on campus, he found himself in the perfect environment to grow as a bassist. He played in rhythm sections backing visiting featured jazz greats such as Dave Liebman, Jackie Byard, Bucky Pizzarelli and Joanne Brackeen. He was selected to perform at the Music Educators National Conference in Miami Florida along with fellow classmate saxophonist Bill Evans. In 1980 he graduated from Willam Paterson University with a Bachelor of Arts as a performance major on double bass. Rick’s become a highly sought after bass player in the metropolitan area. Some of his performance venues include: London, Sweden, Japan, Moscow and from coast to coast in the USA. He held a five-year Monday night trio gig with long time friend, guitarist Vic Juris. Rick has also been actively involved as an educator throughout his career. 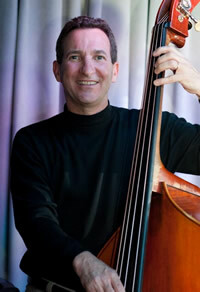 He has taught at many jazz workshops and clinics on both the high school and collegiate level. He has been on the adjunct staff offering private instruction at both William Paterson University and Passaic County College. He also maintains an active roster of private students at his home studio. Rick’s most recent recording, which was released in 2013, was with bassist Michael Moore. However, this was Moore’s debut recording on piano; “The Michael Moore Trio, Live at Shanghai Jazz” featuring Rick on bass and Joe Corsello on drums. Rick has also recently been performing with the Benny Golson Quintet featuring Violinist Viatli Imereli of Sweden. He has also been a long time member of Richie Cole’s Alto Madness Orchestra.